Sitra Holdings (International) Limited is a leading brand-centric distributor of quality wood-based products and lifestyle outdoor furniture. We operate from our headquarters in Singapore which also serves as the marketing and customer service, operational planning, treasury and administrative centre. 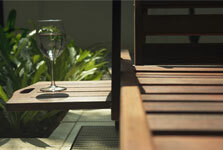 Our lifestyle furniture design function is based in Brisbane, Australia. Currently, we outsource the manufacturing of our products to numerous contract manufacturers located in the Indonesian Archipelago. For the past 27 years, we have grown from our humble origins as a sawn timber trader to being one of the leading distributors of quality wood-based products and lifestyle outdoor furniture, carrying our own brands. Today, we have over 277 corporate customers in 48 countries, and they recognize the quality comes with a Sitra product. From Australasia to Europe, from Middle East to North America, we have consistently sought to bring the best in quality wood, design and innovation to our customers. “Delivering Quality Products, Building Successful Brands”. This has been our vision since day one and its reflected in the awards we received in recent years. We are one of the Enterprise 50 Award winners for three consecutive years in 2004 and 2006. In March 2006, we were awarded the Regional Headquarters (RHQ) Award by the Economic Development Board . As a mark of our emphasis on quality management, we have also been awarded the BS EN 9001-2008 certification for quality management every year since 1997.